Left - 1914-15 Star. 1371 SJT H Linford Norfolk Reg. 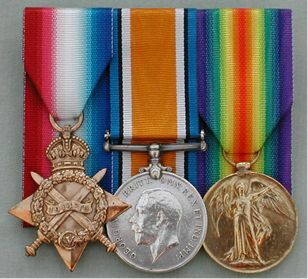 Centre - The British War Medal. 1914-1918 19561 Warrant Officer - Class 2 H Linford The Queens Reg. Herbert was a member of the Sandringham Territorials on the Royal Estate and with the outbreak of war soon found himself engaged in active service. The 5th. Battalion of "The Norfolks" was one of the "Pal's Battalions" and were unique in that nearly all of them were employed by The Royal Family on the Sandringham Estate or had family connections to Sandringham. This battalion had been formed in 1908 at the personal request of King Edward V11th. He asked Frank Beck, his land agent to undertake the task. This he did, recruiting more than 100 part-time soldiers. The order for mobilization reached the 5th battalion on the evening of August 4, 1914, a few hours before the formal declaration of war. On July 29th 1915 they embarked on the S.S " Aquitania" in Liverpool en route for the Dardanelles. They reached Mudros on August 5th, and proceeded, on the 10th, to their landing place, in the thick of fighting, of Suvla Bay. They were immediately ordered inland. The climate was boiling by day and freezing at night. Men were suffering from dysentery and from the side-effects of inoculations and seasick tablets administered during the voyage. There was also a desperate lack of water - two pints were supposed to last each man three days. 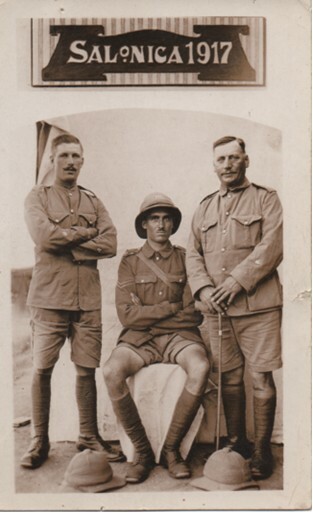 Then, on August 12, just two days after they had arrived in this arid, hostile land, the 5th Battalion was told it was to attack that afternoon. Having been in the baking sun all day the inexperienced troops were now to launch a major assault on a well-armed enemy in broad daylight and with little cover. The orders were confused. The officers were handed maps, which did not even show the area they were supposed to be attacking. At 4.15-pm whistles blew and the Norfolks began to advance, led by Colonel Beauchamp, waving his cane and shouting: 'On the Norfolks, on.' Captain Beck was at the head of the Sandringhams. The slaughter began immediately as the Turkish artillery trained in on the advancing British soldiers. By the time the Norfolks reached the enemy lines they were already exhausted. A desperate battle ensued, officers and men being cut down all around by snipers hidden in the trees. When some of the snipers were later captured, several turned out to be 16-year-old girls. Everywhere officers and men of the battalion were dying. A shell landed close to Frank Beck. He was last seen sitting under a tree with his head on one side, either dead or simply too tired to continue. In the midst of the bloodshed, Colonel Beauchamp continued to advance through a wood towards the Turks' main positions, leading 16 officers and 250 men. Among them were the Sandringhams. Eventually, the Colonel was spotted, standing with another officer by a farm on the far side of the wood. That was the last anyone saw or heard of Beauchamp, or any of his men. Sir Ian Hamilton, Commander-in-Chief of the British Forces in Gallipoli, in his despatch of December 11, 1915 referred to the unknown fate of the 'disappeared' men of the 5th Norfolk Battalion as " a very mysterious thing." He wrote: " The 1/5th. Norfolk were on the right of the line and found themselves for a moment less strongly opposed than the rest of the brigade. Against the yielding forces of the enemy, Colonel Sir H. Beauchamp, a bold, self-confident officer, eagerly pressed forward, followed by the best part of the battalion. The fighting grew hotter, and the ground became more wooded and broken. At this stage many men were wounded, or grew exhausted with thirst. These found their way back to camp during the night. But the Colonel, with sixteen officers and 250 men, still kept pushing on, driving the enemy before them. ... Nothing more was ever seen or heard of any of them. They charged into the forest and were lost to sight or sound. Not one of them ever came back." That, of course is not true. Herbert did manage to get to a house or hut - was it the farmhouse which Beauchamp reached? He was also wounded apparently trying to take cover in a ditch with some of his men and in his desperation to get in laid the opposite way to them. Herbert was shot through the ankle - the others were shot through the head. Amazingly he was picked up by a stretcher bearer and taken to a field hospital. Queen Alexandra made inquiries via the American ambassador in Constantinople to discover whether any of the missing men might be in Turkish prisoner-of-war camps. Grieving families contacted the Red Cross and placed messages in the papers, hoping for news of their sons and husbands from returning comrades. But all to no avail. 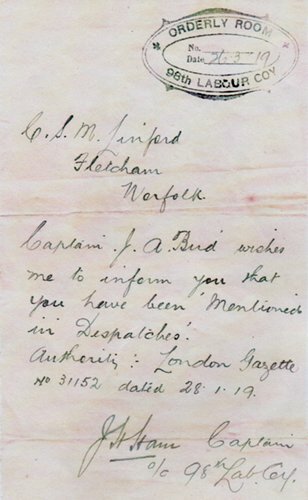 Imagine the feelings of Herbert's mother (Emily Linford) when she received a postcard from him on board a hospital ship saying that he was alive and well! He returned to England to recover from his wounds but mystery and rumour continued to surround the disappearance of the Sandringhams. The final answer can be found in a report compiled by a Royal Commission on Gallipoli completed in 1916 but not released until 1965. Intriguingly, a paragraph reads: "By some freak of nature Suvla Bay and Plain were wrapped in a strange mist on the afternoon of 12 August. This was sheer bad luck as we had reckoned on the enemy's gunners being blinded by the declining sun and upon the Turks' trenches being shown up by the evening sun with singular clearness. Actually, we could hardly see the enemy lines this afternoon, whereas to the westward targets stood out in strong relief against the luminous light." In 1918 when the war had ended, the War Graves Commission searched the Gallipoli battlefields. Of the 36,000 Commonwealth servicemen who died in the campaign, 13,000 rested in unidentified graves, another 14,000 bodies were simply never found. During one of these searches a Norfolk's regimental cap badge was found buried in the sand along with the corpses of a number of soldiers. The find was reported to the Rev Charles Pierre-Point Edwards, MC, who was in Gallipoli on a War Office mission to find out what had happened to the 5th Norfolks. Edwards' examination of the area where the badge had been found uncovered the remains of 180 bodies; 122 of them were identifiable from their shoulder flashes as men of the 5th Norfolks. The bodies had been found scattered over an area of one square mile, to the rear of the Turkish front line 'lying most thickly round the ruins of a small farm'. This, Edwards concluded, was probably the farm at which Colonel Beauchamp had last been seen. More significantly BBC research unearthed an account of a conversation with the Rev Pierre-Point Edwards some years after the war, which revealed an extraordinary detail he omitted from his official report about the fate of the 5th Norfolks - namely, that every one of the bodies he found had been shot in the head. It is unknown at what point Herbert returned to active service. 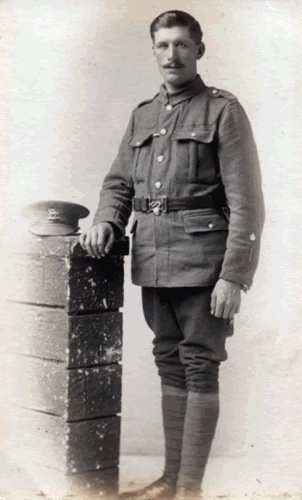 He served with the 14th Queen's (Royal West Surrey's) on home duties before joining the Labour Corps 96th Company in action in Salonika. The card (above, Herbert is far left) was sent to Herbert's mother, (Emily) and on the back of card reads - With my Best Love 'To Weaney' (ie his youngest sister Winnie). Herbert was mentioned in despatches in January 1919 for " gallant conduct and distinguished services rendered during the period from the 1st March to the 1st October, 1918." By the end of the war Herbert had served as a Company Quarter Master Sergeant and Acting Commander Company Major. He received the 1914-15 Star, 1914-1918 British War Medal and the 1914-1919 Victory Medal. Herbert was poised for a very successful Army career and would have dearly liked to pursue this but his hearing had been so damaged by the noise of guns in the war.